Inspired by the concept of a tropical village, Maca Villas & Spa Bali blends 25 private pool villas together with communal spaces within a lush landscape. It is an innovative design that defines the relationship between nature and functionality. Every structural element has a distinct sense of purpose without compromising on style or comfort. The entire property has been built with integrity to ensure that it operates with the smallest possible carbon footprint. 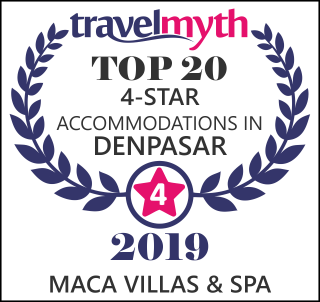 Maca Villas & Spa Bali offers a choice of one and two bedroom self-contained villas that will cocoon you from the hustle and bustle of mainstream tourism. Each villa has been designed with total privacy in mind and is encompassed within a contemporary Balinese compound featuring a private swimming pool. Seamless indoor and outdoor living spaces capture cool ocean breezes and an abundance of natural sunlight. High ceilings and organic structural materials are balanced by customised furnishings and Bali-inspired pieces of contemporary artistry. All villas include LCD flat screen televisions with satellite channels, iPod docking station, high speed internet and a well-equipped mini-bar.